The Funny Music Project‘s (FuMP) comedy music festival/convention, FuMPFest, returns this Friday June 16th to Sunday June 18th at the Holiday Inn Chicage-Elk Grove in Elk Grove Village, Illinois. The Guest of Honor for this year is Henry Phillips. Henry is a comedy musican and actor who has appeared on Comedy Central Presents, Jimmy Kimmel Live, Billboard magazine, worked with Moby, his YouTube channel “Henry’s Kitchen” and his own film “Punching the Clown.” Featured Guests are Bad Teenage Moustache, chiptune-rock band Boy Meets Robot, Carla Ulbrich, Insane Ian, Nuclear Bubble Wrap, Peter Wildman, Reformed Whores, Smashy Claw, The Gothsicles, Tom Tuerff, Worm Quartet, and the great Luke Ski. Also appearing this weekend but with no featured concert are Carrie Dahlby, Devo Spice, Holy Bongwater, Lauren Mayer, Power Salad, the Library Bards, and TV’s Kyle. Events for the con will be several concerts throughout the weekend, but there is more to the event then just them. The Opening Ceremonies will screen the entries this year’s Video Contest, karaoke, Q&A and autographs with Henry Phillips, State of The FuMP, Live Podcasts, the FuMP Showcase, and special showing of Punching Henry, Henry Phillip’s latest mocumentary. Friday will host the Logan Whitehurst Memorial Awards for Excellence in Comedy Music ceremony, all the nominated songs will be performed or presented at the ceremony. There will be a dealer’s room for shopping as well. Pre-registration is opened until June 12th, tomorrow. Registration at the door is the same price. Adult weekend is $50, Friday or Sunday only $20, and Saturday only $30. Children twelve and under can get in for $30 for the weekend or any single day for $15. Children three and under are free. Fans of the FuMP, Dr. Demento, and comedy music in general should keep the FuMPFest are their list of events to try to hit up some time to see and hear their favorite acts and hang with fellow fans. VIP tickets for YOSHIKI’s upcoming classical performance at Carnegie Hall’s Stern Auditorium / Perelman Stage go on sale today, September 29. YOSHIKI — songwriter, drummer/percussionist, classically trained pianist and the creative force of the rock group X Japan — announced the “YOSHIKI Classical Special Featuring Tokyo Philharmonic Orchestra” last week, gaining worldwide attention for the acclaimed Japanese artist’s appearance at the prestigious New York concert hall. The special classical performance, presented by Knitting Factory, will take place on January 12 and 13, 2017. YOSHIKI will perform his original compositions alongside the world-renowned Tokyo Philharmonic Orchestra; he will also play several traditional classical pieces. The Tokyo Philharmonic Orchestra was named one of the Top 10 greatest orchestras in the world by CNN in 2015. This classical concert will also take place in Japan and Hong Kong. Exclusive Limited VIP packages include premium seating, meet-and-greet opportunities with YOSHIKI, signed items, and more. Regular admission tickets are also available at the Carnegie Hall. YOSHIKI composed a piano concerto and performed it with a 77-piece orchestra to celebrate the tenth year of the Emperor of Japan’s reign in 1999. In 2015, he composed the theme song and conducted the Super World Orchestra at the opening ceremony of the World Expo. His classical concerts in 2014 captivated crowds earning him standing ovations and sold out shows in over 10 countries as he performed classical versions of X Japan songs and popular rock tracks with a string sextet live on stage, as well as some traditional Classical pieces. His album, YOSHIKI Classical, debuted at #1 on the iTunes Classical Music chart in 10 countries around the world. Pianist Magazine raved YOSHIKI Classical “is a true labor of love from a talented artist who’s made an impressive mark within the classical and rock genres.” The album featured performances by YOSHIKI as both the composer and pianist with the London Philharmonic Orchestra and Tokyo City Philharmonic Orchestra. Produced by YOSHIKI, the album included two songs produced by the legendary Beatles producer Sir George Martin. YOSHIKI is a songwriter, drummer, and a classically trained pianist. His rock group X Japan has sold 30-million singles and albums combined, and filled the 55,000-seat Toyko Dome a record 18 times. Now the band’s popularity is spreading throughout the world, having recently completed a sold-out World Tour, performing in North America, Europe, Latin America, and South East Asia. In 1999, YOSHIKI composed a piano concerto and performed it with a 77-piece orchestra to celebrate the tenth year of the Emperor of Japan’s reign. In 2005, YOSHIKI composed the theme song and conducted the Super World Orchestra at the opening ceremony of the World Expo. Previously, YOSHIKI also recorded a classical album co-produced and arranged by acclaimed Beatles producer Sir George Martin and performed by the London Philharmonic Orchestra. Recently, the legendary Stan Lee created a Super Hero based on him, and for the first time, a Hello Kitty product line is named after a person – “Yoshikitty”. In 2010, he launched his non-profit organization YOSHIKI Foundation America, a 501©(3) organization, which continues to donate to various charitable organizations, including supporting Japanese Earthquake victims. In 2014, YOSHIKI completed his YOSHIKI Classical World Tour, which took place in 10 different countries (US, Mexico, Russia, Germany, France, United Kingdom, China, Thailand, Taiwan and Japan). In 2016, YOSHIKI was asked to be an advisor to Japan House, which will open in Los Angeles, London and Sao Paulo. These offices are being set up in the interest of promoting Japanese culture and technologies. In 2011, the Tokyo Philharmonic Orchestra celebrated its 100th anniversary as Japan’s first symphony orchestra. With about 130 musicians, TPO performs both symphonies and operas regularly. TPO is proud to have appointed Maestro Myung-Whun Chung, who has been conducting TPO since 2001, as Honorary Music Director, Maestro Mikhail Pletnev as Special Guest Conductor and Maestro Andrea Battistoni as Principal Guest Conductor. TPO has established its world-class reputation through its subscription concert series, regular opera and ballet assignment at the New National Theatre, and a full, ever in-demand agenda around Japan and the world, including broadcasting with NHK Broadcasting Corporation, various educational programs, and tours abroad. In March 2014, TPO became a global sensation in its centennial world tour of six major cities: New York, Madrid, Paris, London, Singapore and Bangkok. In December 2015, TPO held Beethoven’s 9th symphony concerts in Seoul and Tokyo with Maestro Myung-Whun Chung, with Seoul Philharmonic Orchestra combined into one orchestra. TPO has partnerships with Bunkamura Orchard Hall, the Bunkyo Ward in Tokyo, Chiba City, Karuizawa Cho in Nagano and Nagaoka City in Niigata. BRKfest the midwest’s longest running chip music festival is back for the end of summer for its fifth year. It will be Friday September 2nd to Sunday September 4th at the Chameleon in Cincinnati, Ohio. Friday night starts 9pm with cooshinator, Umin, Monotony, Hypnogram, Snesei, nonfinite, and boaconstructor all doing forty minute sets till late at night. Saturday is Bit Wish, Infodrive, KITE SPLASH, AndaruGo, Triangles, Kris Keyser, Bubblegum Octopus, and Bit Shifter starting at 8pm. Sunday starts at 9pm and features Dsv101, Solabear, Inverse Phase, CCDM, Dollfin, and hedonismbit. Closing Ceremonies will be at 1am with DJ Boa. Fans, and those wanting to be fans, of chip music will want to at least catch one day of the event to hear great music and party with fellow fans. FuMPFest is a weekend of comedy music presented by the Funny Music Project. This year’s event is this August 26-28 at the Holiday Inn Chicago in Elk Grove, Illinois. There will performances, panels, interviews, parties, and much more. There’s plenty of ways to be part of it even if you do not make it out yourself. They are taking pre-orders on FuMPFest 2016 t-shirts until July 31st. You do not even have to go to the con to pick up, they will ship it to you. You can become a sponsor of FuMPFest for only $75. You will get your logo in the program book, on each of the banners at the event, on the website with a link back, and company’s name once per day on the main stage. You can also get discount on program ads, gift bag items, screen time, or more if you want. Or you could donate so Nerdy and Geeky Music Blog can be a sponsor. We would also need a logo design too. They are holding a Video Contest for anyone to create an original video for any FuMP song to win two free badges to FuMPFest 2017 with two nights in the hotel. Second place gets a free six month subscription to the FuMP and third place gets one free item from the TheFuMP.com store. The entries will be shown during Opening Ceremonies on Friday and the winners announced at Closing Ceremonies on Sunday. You do not even have to be at the con to win. Fans of comedy music and the FuMP here is your weekend. Check the website for performers and activities. With the conclusion of Perfume ‘s most recent live shows held in Asia, Europe, and for the first time, in the United States, the famed Japanese pop trio’s very first feature-length documentary titled, “WE ARE Perfume -World Tour 3rd DOCUMENT-” presents an in-depth look into the making of Perfume ‘s recent international tour. The film will be released simultaneously in Japan and the U.S., with U.S. premieres set to take place in New York and Los Angeles on two consecutive days, Saturday, October 31st and Sunday, November 1st 2015. WE ARE Perfume ” will also be the first feature-length documentary to hold a simultaneous Japan and U.S. release. Additional screenings will also take place in Hong Kong, Mexico, Singapore, and Taiwan. The theme song to “WE ARE Perfume ” is also the group’s next single, “STAR TRAIN,” written by Yasutaka Nakata (from the Japanese electro house group, CAPSULE). The single, which scheduled to drop on October 28th 2015, is penned as the culmination of Perfume ‘s 15-year career. their goals for the future. This is Perfume ‘s nonstop evolution. Their “now” is here. about the world tour, the group’s formation, and a look back on their successful career to-date. These exclusive interviews can only be seen in the movie. France for the first time which spread their recognition to the western markets. formation and 10th since major début in 2015. Japanese artists of various genres around the world. ReplayFX is an arcade and gaming festival at the David L. Lawrence Convention Center in Pittsburgh, Pennsylvania from Thursday July 20th to Sunday August 2nd . There will be 700 arcade and pinball machines on free play, over 2,000 retro console games, tabletop games, showcase by game developers, seminars, magicians, live music, balloon artists, face-painters, and competitions for over $110,000 in prize money. They have plans for eight musical performances. On Thursday there will be performances by Triforce Quartet a traditional string quartet that plays video game music and Universal Beat Union an electronic-rock fusion band that makes music for galactic space-time travelers. Friday Scott Blasey the lead singer of The Clarks will be playing an acoustic set, Flashback an 80’s cover band, and The OneUps a musical collective who play their own intricate and eclectic approach to video game music. Saturday will see a performances by Super Smash Opera a live musical comedy based on the Super Smash Bros series, Inverse Phase a video game composer and chiptune musician, and Dancing Queen a dance band. Inverse Phase is also doing a seminar on Friday called Chiptune/8-bit music: What is it? How is it Written. You will learn how to write your own chiptune music. The Pittsburgh Symphony Orchestra will be performing an evening of Final Fantasy music at the nearby Heinz Hall on Saturday night. Regular event passes for the weekend are $94.99. Single days and kids under 12 are cheaper. VIP passes start at $150. A bit much, but they have all kinds of crazy things to do the there besides all the games and music. The 2015 J-POP SUMMIT, the Japanese pop culture event held annually in San Francisco, has announced DAY 1 programming. This year’s festival is highlighted by live music from a wide range of pop, ani-pop, electronica, punk/alternative, and a cappella artists, as well as live comedy and other acts to complement an extensive roster of attractions, participants and exhibits, and other live programming. The 2015 J-POP SUMMIT takes place Saturday and Sunday August 8th & 9th at the historic Fort Mason Center in San Francisco’s Marina district. Tickets and V.I.P Passes are available. Both types of passes include access to daytime programming as well as the J-POP LIVE NIGHT concert. V.I.P Pass holders will have priority access to a premium viewing area and will be invited to an exclusive Meet & Greet Event with JAM Project on Saturday, August 8th and Eir Aoi on Sunday, August 9th respectively. Details to be announced soon! This year’s live performers reflect the diversity and unique creative expression that is burgeoning in Japan and capturing a global following. The first-ever 2-night event J-POP LIVE NIGHT tops off DAY 1 Saturday, August 8th, with an evening concert by anime music super-group – JAM Project – as well as live sets from pop singer, Eir Aoi, frenetic rock band, Gacharic Spin, and returning all-girl punk rock acts, JinnyOops! and the Akabane Vulgars on Strong Bypass. During the afternoon of Saturday, attendees also will be treated to the U.S. début of Little Glee Monster, an extraordinary 6-member female a cappella group that has received wide acclaim in Japan for their unique vocal treatments to a range of popular Japanese and English songs. Also making their début at J-POP SUMMIT will be FES★TIVE, a unique act built around the concept of Japanese “festivals” that has garnered a global following with their up-tempo, catchy sound. The hilarious antics of the comedy duo, Jaru Jaru, also come to U.S. shores for the first time as does the stylish female pop duo, Faint★Star. J-POP SUMMIT also introduces attendees to a brand new way to show their love of favorite Japanese idols with the Cheerz App, on which users can upload photos to show support for a wide array of top artists, including ones performing at J-POP SUMMIT. Cheerz users also can receive additional opportunities for visibility and promotion based on their photo’s popularity among other users of the app. Over 300 top Japanese artists are currently active on Cheerz and since its launch in December 2014, fans have cheered on their favorite idols over 40 million times. Stay tuned for J-POP SUMMIT DAY 2 programming to be announced very soon! J-POP LIVE NIGHT on Saturday begins at 4:30pm on the J-POP SUMMIT Main Stage inside the Fort Mason Pavilion. Specific set times will be posted shortly. JAM Project is an anime music super-group founded in 2000. The group is composed of the top vocal artists that are each renowned for their work in the anime industry. The members came together to create and perform powerful theme songs for anime, tokusatsu (SFX movies and TV), and video games. Since their début, the JAM Project has produced and released hundreds of anime and video game theme songs, including the themes to Super Robot Wars, GARO and Tomica Hero. The group toured internationally in 2008, 2012 and 2015. Current regular members are Hironobu Kageyama (singer of “Dragon Ball Z” opening theme), Masaaki Endoh (singer of “Yu-Gi-Oh! 5D’s” opening theme), Hiroshi Kitadani (singer of “ONE PIECE” opening theme), Masami Okui (singer of “Revolutionary Girl Utena” opening theme) and Yoshiki Fukuyama (singer of “Macross 7” opening theme), who will all perform in San Francisco! Eir Aoi is a Japanese singer from Sapporo, Hokkaido that is signed to SEM Records (Sony Music Entertainment. She gained wide popularity after several of her songs were used as the opening and ending themes for many popular anime series including Kill la Kill, Sword Art Online II and Season 2 of Aldnoah.Zero. She has built a worldwide fan base and embarks on her first international tour this summer. Celebrating their 5th anniversary this year, Gacharic Spin is a true force of musical power from Japan! One of their songs is now used as the ending theme for Dragon Ball Kai. Taking their name from the word, “Gacha,” derived from a Japanese word gacha-gacha, meaning clattering, each members’ character and sound clatters and mixes perfectly with singers Hana and Oreoreona’s powerful and melancholic voices, to result in a spectacularly unique sound. The band is signed to the JVCKENWOOD Victor Entertainment Corp. Taking hints from everything from pop to rock and industrial music, their energy-filled live performances and excellent musicianship have made them a very fun band to watch! Returning to J-POP SUMMIT for their first time since 2010 is JinnyOops!, the 3 -piece indie punk band from Osaka, Japan. The group, which is composed of Mitsuyo Ishibashi (guitar/vocals), Chihiro Ishida (Bass), and Hitomi Futemma (Drums) are known for their wild and explosive punk sound and have made several appearances in the US. The Akabane Vulgars on Strong Bypass are a Japanese female punk rock trio from Tokyo. Formed in 2005, the band has Kei Sofue on drums and sisters Yumi and Miki Uchizono on vocals/guitar and bass, respectively. After playing at SXSW 2012 in Austin, Texas, the band embarked on a US tour and headlined the J-Pop Summit Festival in San Francisco. Known for their energetic live performances, the band has played countless shows internationally and have established a loyal fan base in Japan, as well as overseas. This 6-member group composed of teenage girls has gained wide acclaim for their exceptional vocal skills and harmonies. Little Glee Monster was formed in Tokyo in 2013 by winners of a “Best Young Female Singer Audition” contest. The music video for the group’s first single, Houkago High Five, featured on their major label début for Sony Music has been viewed more than 500 million times! Little Glee Monster’s “Gao Gao All-Star” was selected as the ending theme song for the Pokémon XY anime series and their music also will be featured in the upcoming anime feature, Pokémon XY The Movie: The Archdjinni of Rings. Faint★Star is a Japanese pop-duo consisting of Hina (formerly of Tomato’n Pine) and Yuria that debuted in 2014. The duo gained international popularity after a Tokyo Girls Update article on their 1st music video became the most viewed article on the site. 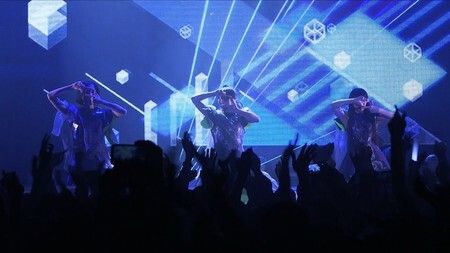 Faint★Star is produced by one of the most famous music agencies, “agehasprings,” and are known for their live performances that integrate advanced visual technology. The 8-piece Japanese idol group, “FES★TIVE, is a unique act that builds on the concept of “festivals” and focuses on performing at Japanese festivals all over the world. FES★TIVE made its major label début on Tokuma Japan in May, and throughout 2015, they will continue to showcase their “FESTIVAL FROM JAPAN” theme to intentional audiences. With their up-tempo and catchy sound, FES★TIVE is a rapidly growing force in the international music scene. Jaru Jaru is a Japanese comedy duo made up of Shusuke Fukutoku and Junpei Goto, and managed by the Yoshimoto Creative Agency. The pair is one of the most successful and popular comedy acts in Japan with their brand of Manzai – a traditional style of Japanese comedy consisting a fool and a long-suffering companion. In the twelve years that they have been active, the duo has received countless awards, made many TV appearances, and even starred in several movies.